Looking for an easy open access studio to work from and following a Kickstarter promotion in 2012, Kim Willoughby, Eric Greene and Alex Pacheco opened the doors to Damn Fine Print in Smithfield. Based on North Brunswick Street, DFP is now currently run by Kim Willoughby and studio manager Maisie McNeice. Over the last two Dublin OFFSETs we have been lucky to have the guys in our foyer to spread screen printing to the masses! On a recent studio visit to our neighbours we caught up with Kim for a chat about the studio and see them in action with some of this year’s screens for OFFSET 2015. What’s the typical day in DFP? No day is the same! 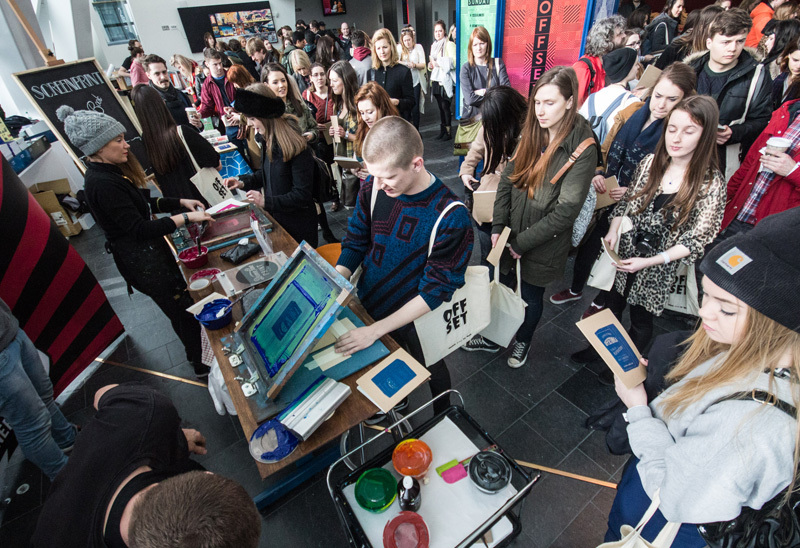 Our day could involve fun stuff like hosting creative workshops, teaching beginners screenprinting techniques, working with brands to help engage guests at events and conferences with our mobile pop up print bar. Then of course there is the administration end and day to day running of a studio to take care of. Ensuring the studio is a nice space and equipped well for our members to work from. Over the last few years there’s been an upsurge in people learning the craft of screenprinting and more of an awareness of screen prints, why do you think that is? I think the recession brought a real DIY attitude back. I also think our generation are stuck on computers all day, theres a real update in physical hands on arts and crafts. Theres nothing like getting your hands filthy in real live ink! DAMN FINE PRINT has been at OFFSET in an official capacity now for the last two Dublin OFFSETs. What was the initial thinking behind your presence? We wanted to bring screenprinting from behind stuffy studios and into the masses and show people how accessible screenprinting is. 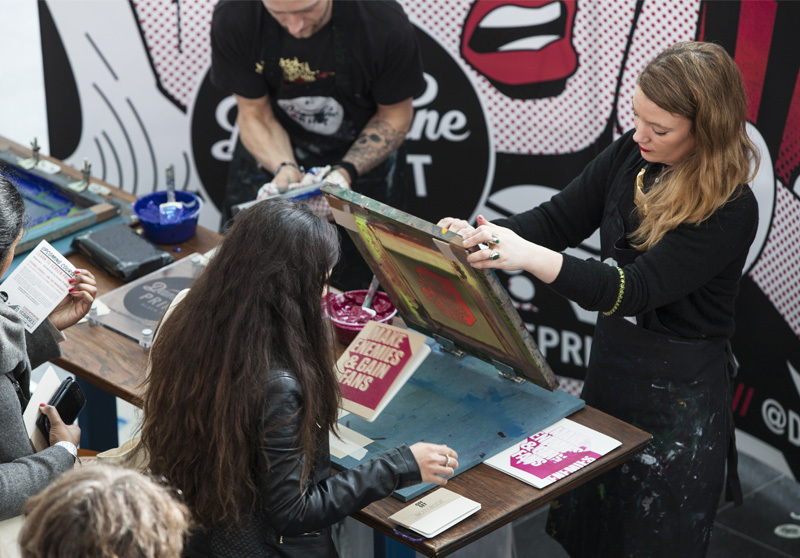 Plus we knew it would be an amazing opportunity to collaborate with OFFSET artists and get creative and let OFFSETTERS experience the fun to pull their own print! What have been people’s reactions to you guys in the foyer? 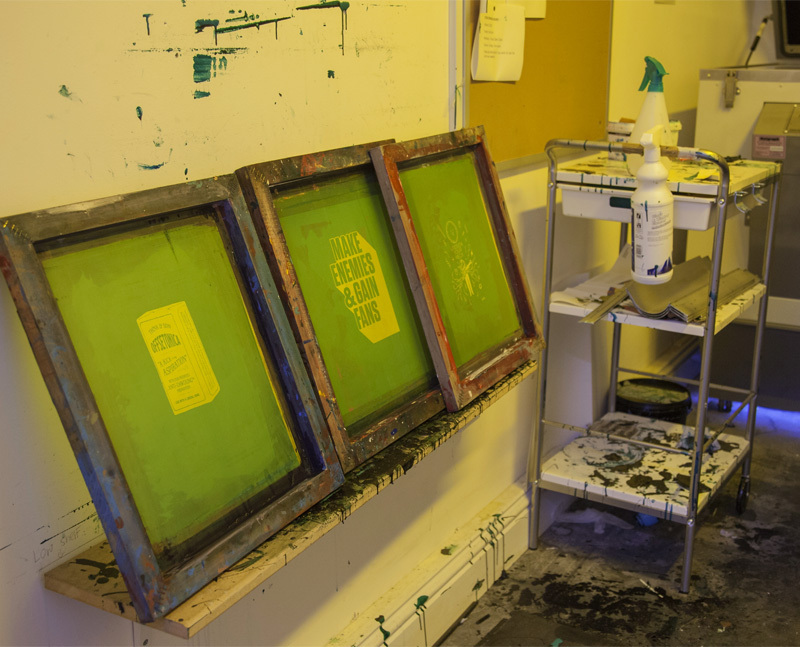 We are a tad biased but we believe screenprinting is MAGIC! At OFFSET when folks pull a print for the first time, that reaction on their face when their print is revealed is the magic we are talking about. It’s just priceless. At OFFSET people loved pimping up their doodle-books so much they were queuing up to print and print again and we were literally running out of pages! We printed peoples tshirts, bags, notebooks, I think we printed one guys arm!! Whose screens have been your favourite to print for OFFSET? Ah we love them all! we couldn’t possible favour one! 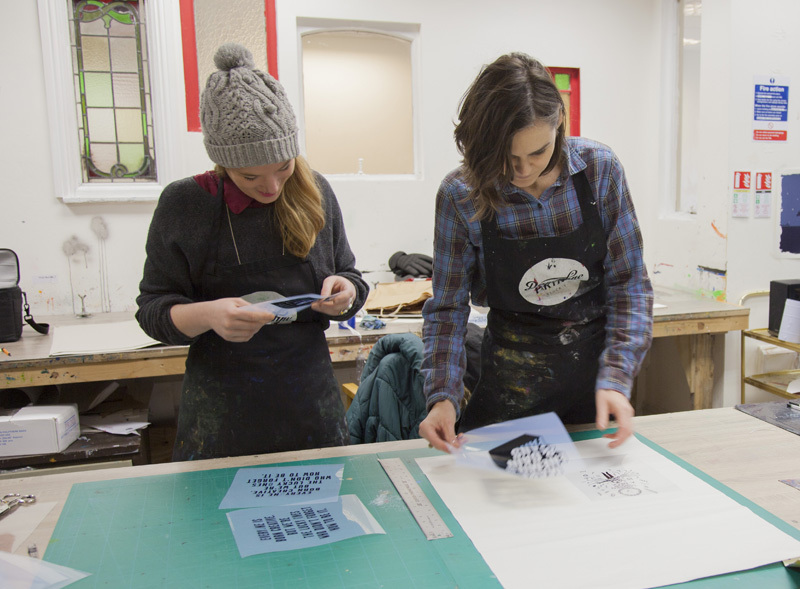 Dame Fine Print run a monthly, 4 week intro to screenprinting courses usually on a Monday or Tuesday evening and t-shirts, 1 day workshops on the last Saturday of every month. They have an open access studio also which is open to new members, no experience necessary AND they will soon be launching a repeat patterns fabric printing workshop. Keep an eye on there Facebook page and website for more details. Damn Fine Print will also host the latest exhibition from screenprint artist Neil Dunne this Thursday. More on that during the week! Photography by Neil Dorgan, Oliver Smith and Lauren Pritchard.